If you are in immediate danger – call 000 NOW! 1800 RESPECT (1800 737 732) or visit www.1800respect.org.au. Call 1800 811 811 or visit DV Connect on www.dvconnect.org/womensline. 13 11 14 or visit Lifeline at www.lifeline.org.au. 1300 224 636 or visit Beyond Blue at www.beyondblue.com.au. The Tara Brown Foundation is a charity named in memory of Tara Brown, a young mother who died on September 9th, 2015 at the hands of her partner during a horrific act of domestic violence. It was the circumstances surrounding her death that forged the idea for this foundation in the hope that our loss might serve to prevent similar tragedies to others. And to help the public in general better understand that Domestic Violence isn’t isolated to certain stereotypes – it can happen to anyone, anywhere. Tara was not alone. In fact, she belonged to a large, extended family and was very loved. She was outgoing, an accomplished touch football player and celebrated many achievements at the highest levels of the game. She was well respected by the touch football community. The thing that really made people gravitate towards Tara was her always-present smile, her positive attitude, and that she never had a bad word to say about anyone. She was a pleasure to be around and to have around. When Tara was trying to leave her partner, she was forced to stay for a short time in a DV (domestic violence) refuge. The refuge was of low standard and was certainly not the sort of accommodation that a young mother with a three year old child should ever be forced to endure while fleeing the dangers of a violent partner. Unfortunately, Tara left the refuge and was found by her partner. And killed. This has inspired us to establish the Tara Brown Foundation. Our goal is to raise funds to upgrade and assist needy refuges and women’s shelters, and any other worthwhile DV organisations that help women and their children escape violent and controlling partners. We will send funds to existing organisations that may be struggling financially and are sincerely in need of our help. In effect: We are here to help the helpers! It’s Here! It’s Going To Be Huge! And You Dont Want To Miss Out! 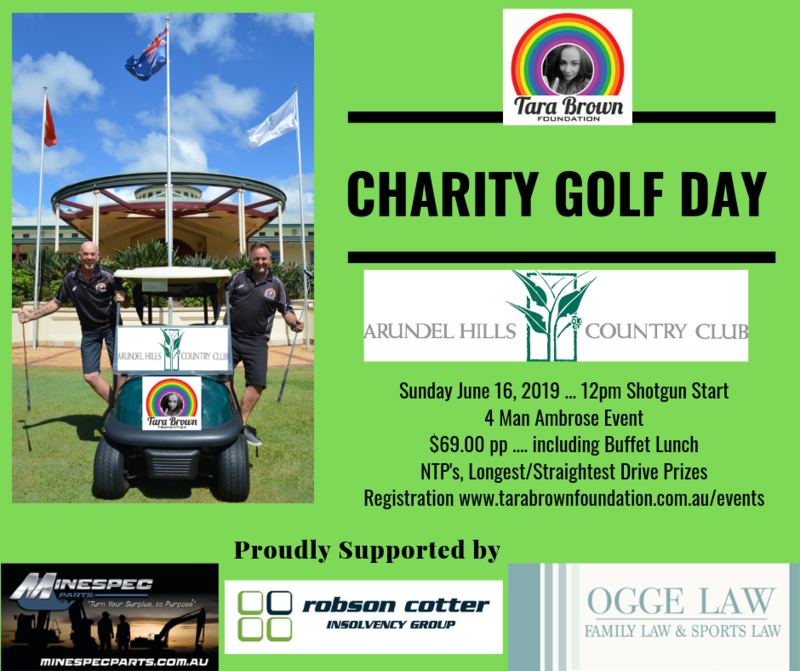 The Inaugural Annual TBF Charity Golf Day. This will be a great day of fun – whether you are a serious golf player or just a hacker (like us!) And four person “Ambrose” teams makes it all serious fun. Prizes for closest to pin, best team, worst team, longest drive and more. You can register as a team or as an individual (you will be put into a team on the day) by clicking this flyer, and filling in the reg form and paying. *NOTE* Your team/single reg is only complete when payment is made. There are only very limited tickets available and WILL SELL OUT FAST! We Would Proudly Acknowledge Sponsors Of TBF Charity Golf Day! The Tara Brown Foundation is a 100% non profit charity and any money donated goes directly to the people that need it.